Ages 4 and up. STEP3 - We shortly sort it out based on the evidences given, and let you know the result ASAP. 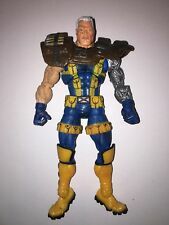 Marvel Universe Cable - Loose Complete - GREAT SHAPE! Marvel Universe MYSTIQUE Series 2 029 MIP 3.75"
5 out of 5 stars - Marvel Universe MYSTIQUE Series 2 029 MIP 3.75"
1 product rating1 product ratings - Marvel Universe MYSTIQUE Series 2 029 MIP 3.75"
Trending at C $30.39eBay determines this price through a machine-learned model of the product's sale prices within the last 90 days. · Marvel UniverseCable (No Baby Hope Variant). · Released in 2011. (Loose) 2018 Marvel Legends Deadpool W.1 Sasquatch BAF "Cable" Figure (No BAF) . Condition is Used. Shipped with USPS First Class Package. Now for the not so fine print. AS IS WAY IS. WE DO NOT ACCEPT E-CHECKS THEY WILL BE CANCELLED. This box is sealed so the Sasquatch BAF piece is included, as shown. There is a bend across the back of the box along the tab as shown picture #4. The tab also has a small bend in one corner as shown in picture #8. ToyBiz Marvel Legends 2004 Series VI 6 CABLE Action Figure X-MEN X-Force Toy Biz. Condition is New and attached to blister. Package was damaged so shipped only on the blister. Never removed from packaging. Sold as is - new, sealed and never been opened. MARVEL LEGENDS 6" CABLE SASQUATCH. CHECK FOR PRICING. Don't miss your second chance to own the original. Don’t delay! See photos. What you see is what you get. BUY MORE AND SAVE! FROM TOY BIZ MARVEL LEGENDS SERIES VI. I CAN SEND MORE PICTURES TO YOU, IF YOU NEED THEM, I AM COLLECTOR SO, I MAKE SURE MY STUFF IS WELL TAKEN CARE OF. This is from my collection, never played with. Thanks for looking!! ITEM HAS MINOR SHELF WEAR. WE WILL ALWAYS GET BACK TO YOU AS QUICK AS WE CAN. The weapon changes its tail and can swing up and down and left and right at a certain angle. The alloy parts are in the sole part of the foot and fill the hollow of the sole. The head carving eyes are lit, the chin is movable. Collector owned. In great condition! We will respond within 24-48 hours, and in most cases sooner. Take a look at our fantastic shape-shifting toys! The head adds a light effect, which further reflects the effect of the statue;. Statue-level painting, the first attempt to make old effects, increase the filling of dragon-type integrity accessories;. Alloy parts in the sole of the foot and fill the holes in the sole of the foot. Head carving eyes light, jaw movable. Weapons can swing from top to bottom at a certain angle by changing their tails. Highlight 1: Super Movable Knight Column. 100% Genuine. BAF part not included. You will be greatly appreciated. We will surely solve the problem for you satisfactorily. It is fast,easy and safe.if you use e- check on paupal as we will hold your order unit your e-check clear. Age appropriate: over 15 years old. Cable (Deadpool Wave). This sealed piece contains a BAF piece for: Marvel's Sasquatch. This piece is still factory sealed and has not been opened. This piece is still factory sealed. You will be greatly appreciated. We will surely solve the problem for you satisfactorily. It is fast,easy and safe.if you use e- check on paupal as we will hold your order unit your e-check clear. Main material: ABS plastic. The boxes does show shelfwear as well they are not mint. There may a slight deviation in colour of actual product due to lighting affect when taking photographs. Steel lock 29CM. Marvel Legends Series 6 'Cable' X-Men Toy BizJim Lee Blue Yellow Costume Rare! He is also missing his gun. His joints are a bit loose but can still hold a dynamic pose. --Hi there! One:12 Collective body with over 30 points of articulation. Prd-order will be fulfilled for the highest priority. Alternate head. 4 Sets of hands. Plasma cannon. About Pre-order Policy Box Contents. MARVEL LEGENDS CABLE X-MEN JUGGERNAUT BAF SERIES HASBRO NEW VHTF. Condition is New. Shipped with USPS First Class Package. You will be greatly appreciated. We will surely solve the problem for you satisfactorily. The weapon changes its tail and can swing up and down and left and right at a certain angle. The alloy part is in the sole part of the foot and fills the hollow of the sole. The head carving eyes are lit, the chin is movable. These Cable Marvel Select figures are amazing and an awesome addition to anyone’s collection. Factory sealed and ready to ship. All sales are thru Pay Pal only. And funds must be collected within 48 hours. Please check out my other listings. I do ship outside of the U.S. As long as you use the global shipping program.All my listings ,I do my best to try to show any pictures of imperfections on them. I will ship to Hawaii, Puerto Rico and Alaska but the shipping and handling will have to be modified for the distance before you pay, so please message me if you have any questions on shipping or items. Thanks for shopping with me. Diamond Select, Marvel Select: Cable Action Figure, OCT142189, $34.99, New, From the distant future he came, the son of Cyclops, the bane of Stryfe, the man called Cable!, Figure is in 7" Scale, 8 , SK-006TA2-001, 699788179420, 9781605845869. Highlight 2 (Dinosaur Form) The legendary warrior has a height of about 34CM and a dragon length of 57cm. The weapon changes its tail and can swing up and down and left and right at a certain angle. We believe that any problems will be solved through communication. Type: shape-shifting toy. We will do our best to reduce the risk of tariffs. Fashion design, 100% new, high quality! And we will do our best to solve the problem and give you a satisfying answer. Deadpool Sasquatch Wave. Marvel Legends.